Digital Sustainability Report. - nexxar lab. - nexxar lab. ProSiebenSat.1 thinks “digital first” with the Sustainability Report. With the Sustainability Report 2017, ProSiebenSat.1 went one step further compared to previous years. Instead of the detailed image parts of the Public Value Report 2015/2016 and the following report update 2016, a more detailed report on the sustainability key topics of the Group was published in June 2018. This also led to changes in the development process with the aim of making it as clear and flexible as possible. The entire report was therefore produced as part of our Online FirstTM process, which provides both an online and a PDF version of the report. The big advantage of this approach is the central data source that is the basis for all report formats. Both the online and the PDF version come from one and the same source: the online CMS, on which changes can be made shortly before publication. The PDF can be generated at any time at the push of a button and amendments are immediately visible. Design and concept are based on the annual report, which was completely redesigned this year. In the annual report, the three key segments of the Group are in the foreground, e.g. representing the entry into the report on the landing page. This idea was transferred to the sustainability report, where the “five pillars of sustainability” – the Group’s most important material sustainability topics – guide users through the report. It begins with the introductory animation on the landing page, where users are welcomed by a 3D animation that quickly transitions into clickable content. The design is elegantly aligned with the content and the movement of the animation is motivated and purposeful. The “five pillars of sustainability” also can also be found in the structure of the report, representing the five main chapters. For better emphasis and identification, we designed icons for each pillar. In order to give the report its own mark compared to the annual report, the colour gradients and graphics have been expanded to include the ProSiebenSat.1 Petrol, a turquoise tone that enhances the color spectrum of the report. As mentioned above, the PDF report was generated from the online version. Only the cover and the chapter dividers where typeset. All the content pages were transferred to the PDF layout through automated processes, including the existing photos, graphics and spreadsheets. The PDF cover was derived from the landing page animation, so that the “five pillars” act as a prominent key visual in both formats. 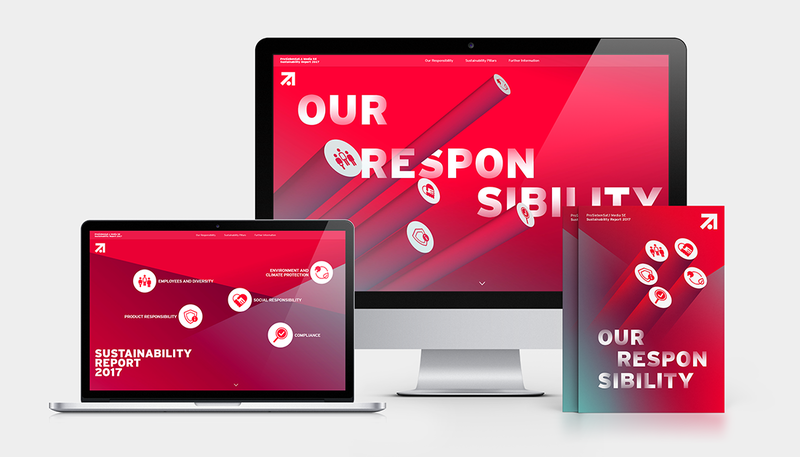 Again, the annual report was the model for the design of both online and PDF formats. Both reports needed to have a common look-and-feel but were created making use of completely different processes: “classic” typesetting for the annual report as opposed to an automatically-generated PDF version in the case of the sustainability report. Still, the results are practically indistinguishable. Also worth mentioning: the sustainability report’s printing process was awarded the CradleToCradle Silver certificate, further emphasising a consistent endeavour towards achieving ​​sustainability.